Jetstress – Too Many IOPS? Customer reported Jetstress failures with the message, “Fail – The test has 1.05381856535713 Average Database Page Fault Stalls/sec. This should be not higher than 1.” The customer had recently purchased multiple servers to be used in an Exchange DAG and these Jetstress failures were halting the project. What was unique about this deployment is the customer was using all local SSD storage for the solution. Let’s spend some time covering how Jetstress is meant to behave, as well as the proper strategy for effectively utilizing Jetstress. Your first step in working with Jetstress should be to download the Jetstress Field Guide where most of this information is held. The primary purpose of Jetstress is to ensure a storage solution can adequately deliver the amount of IOPS needed for a particular Exchange design BEFORE Exchange is installed on the hardware. You should use the Exchange Sizing Calculator to properly size the environment; using inputs such as # of mailboxes, avg. messages sent/received per day, and avg. message size. Once completed, on the “Role Requirements” tab you will find a value called “Total Database Required IOPS” (per Server) which tells you the amount of IOPS each server must be able to deliver for your solution. The value for “Total Log Required IOPS” can be ignored as Log IO represents sequential IO which is very easy on the disk subsystem. With the per server Database Required IOPS value in hand, your job now is to get Jetstress to generate at least that amount of IOPS while delivering passing latency values. This is where some customers get confused due to improper expectations. They may think that Jetstress should always pass no matter what parameters they configure for it. I can tell you that I can make any storage solution fail Jetstress if I crank the thread count high enough, so it actually takes a bit of “under-the-hood” understanding to use Jetstress effectively. Jetstress generates IO based on a global thread count, with each thread meant to generate 30-60 IOPS. Simply put, if I run a Jetstress test with 2 threads, I would expect it to generate ~120 IOPS on well performing hardware. Therefore, if my Exchange calculator stated I needed to achieve 1,200 IOPS on a server, I would begin by starting a quick 15min test with 20 threads (20 x 60=1,200). If that test generated at least 1,200 IOPS and passed, I would then run a 24hr test with 20 threads to ensure there’s no demons hiding in my hardware that only a long stress test can uncover. If that test passes then I’m technically in the clear and can proceed with the next phase of the Exchange project. Making sure to keep my calculator files, Jetstress configuration XML files, and Jetstress result HTML files in a safe location for potential future reference. You could spend an hour reading the Jetstress Field Guide but what I’ve just covered is the short version. Get it to pass with the amount of IOPS you need and you’re in the clear. Of course it can often be much more complex than that. You may need to tweak the thread count or update hard drive firmware or correct a controller caching setting (see my post here for the correct settings) to achieve a pass. Auto-tuning actually makes this process a bit simpler, as it tries to determine the maximum amount of threads (which as stated is directly proportional to generated IOPS) the system can handle. However, it can lead to some confusion as people may focus too much on the maximum amount of IOPS a system can deliver instead of focusing on the amount of IOPS you actually need. While it’s certainly a valuable piece of information to know for future planning or even hardware repurposing, you shouldn’t stall your project trying to squeeze every last bit of IOPS out of the system if you’re already easily hitting your IOPS target and passing latency tests. As someone who works for a hardware vendor, I’ll often get pulled into an escalation where a customer has opened Jetstress, cranked the thread count up to 50, it fails, and they’re pointing the finger at the hardware. However, based on what we already discussed, a thread count of 50 would be 3,000 IOPS. This is fine if the storage purchased with the system can support it. A single 7.2K NL SAS drive can achieve ~55 IOPS for Exchange database workloads, so if a customer has 20 single-disk RAID 0 drives in a system, the math tells us they can’t expect to achieve much more than 1,100 IOPS (20 x 55=1,100). It gets a bit more complicated when using RAID and having to consider which disks are actually in play (EX: In a 10-disk RAID 10, you only get to factor in 5 disks in terms of performance, due to the other 5 being used for mirroring) as well as write penalties when using RAID 5 or RAID 6. The bottom line is that you need a realistic understanding of the amount of IOPS the hardware you purchased can actually achieve, as we all must adhere to the performance laws of rotational media. Coming back to the issue at hand, now having an understanding of how Jetstress is supposed to work, we see why the results were troubling. Jetstress actually should NOT be generating that many IOPS when using 35 threads. 35 threads should generate ~2,100 IOPS not 25,000 IOPS (35 threads x 60 expected IOPS per thread=2,100). More IOPS is not a good thing because if nothing else, Jetstress is supposed to be predictable in terms of the amount of IO it generates. So why did this system generate so many IOPS and why did it fail? The short answer is that Jetstress doesn’t play well with SSD drives. It will always try to generate more IOPS per thread than expected on SSD storage. As I am not a Jetstress developer I can’t explain why this occurs but after several colleagues have also seen this issue I can at least confirm it happens and provide a workaround. In our customer’s case, they manually specified 1 thread which generated ~2,200 IOPS and passed without any Page Fault Stall errors. This was still way more IOPS than 1 thread should be generating but it achieved their calculator IOPS requirements and allowed them to continue with their project. 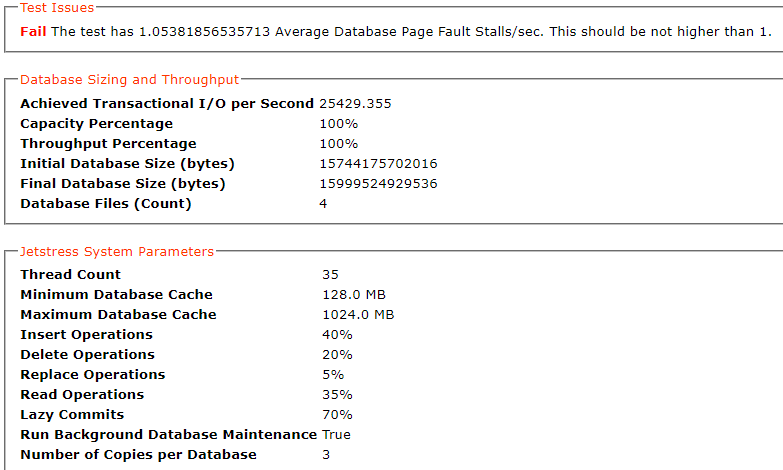 As for why the test was failing with Page Fault Stalls, even though actual disk latency was fine, I can only speculate. As a Page Fault Stall is an Exchange-related operation (related to querying disk for a database page) and not a pure disk latency operation, I wonder if Jetstress is designed to even generate that many IOPS. I’ve never personally seen it run with more than a few thousand IOPS, so it’s possible the Jetstress application itself couldn’t handle it. I hope this cleared up some confusion around how to effectively utilize Jetstress. Also, if you happen to come across this specific issue I’d be interested in hearing about it in the comments. All information is provided "AS IS" with no warranties, and confer no rights, and as such you perform at your own risk. NOTE: You should always make a backup of your server or export the registry before making any changes to it.